OVERVIEW: The Amana ASD2627KEW was recently rated a Consumer Reports best buy. We have to say that this was by far one of the best side by side refrigerator models we have covered in this price range. It has an attractive design, it holds temperature efficiently and effectively and it comes with a wealth of features that make this model a true standout in the Amana line as well as all side by side refrigerator models. STYLE: The styling of this unit is fairly simplistic, but quite effective. We found that Amana really took the time to get some of the details right. We love the way the handles blend in with the rest of the unit and the look of the ice/water dispenser is also quite attractive. 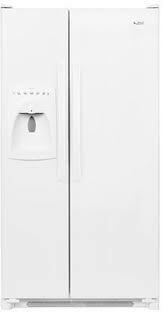 CAPACITY: This Amana Fridge Freezer has a 25.6 cubic foot interior which was one of the larger side by side refrigerators in this price range. The Amana is truly well designed -- even with our "test stock" (typical weekly food supply for a family of four), the fridge provided ample storage space. The 10.0 cu. ft. freezer was larger than most in this category, and the space was well engineered. NOTABLE FEATURES: The ice maker on this Amana Side by Side Refrigerator was able to crank out almost 7 pounds of ice per day. Compare that with the 3.4 pounds of ice that most conventional ice makers put out and you can see how signficant this is. The freezer light came in handy (you'd be surprised how many side by side refrigerators don't have this feature). The "tilt-out" door bins and the beverage chiller was a great addition. DIMENSIONS: Its dimensions are: DEPTH – 33 1/4 in., WIDTH – 35 5/8 in., HEIGHT 70 in. MSRP: $1,349.99 was the MSRP from Amana but we are sad to say that this beautiful fridge is no longer being made and is discontinued.